Welcome to this second podcast of Russian Made Easy. Let’s start by reviewing what we learned in the first podcast. Although we learned eleven new words — which is a lot — eight of them were cognates, so it was still a manageable amount of new words. Anyway, imagine you’re in Moscow with some friends of yours who don’t know any Russian. After each Russian phrase you hear, please say the English translation out loud. Ready? So, how did you do? If you got all of those, you should feel really good about yourself. If you had trouble, then it’s probably a good idea to listen to the first podcast again, taking written notes as you go. Although, don’t worry too much. These podcasts are cumulative, so you’ll get more practice and exposure to all the words we learn. So, how would you translate ЭТО? You need to know both the normal English version and the super-literal version for each phrase you learn. This is what I was referring to at the end of the first podcast: The biggest mistake that virtually all language students make is they don’t learn the super-literal translation of things…what we call the SLT. As you’ll see throughout these podcasts, I’ll always point out the SLT. This is a great shortcut to actually thinking in Russian. He said: This is vodka. If you’ve never had it, by the way, borscht is a delicious soup made with cabbage, beets, potatoes and a bit of pork. Now let’s re-do this dinner scenario, except this time let’s ask about the food or drink. So, ask Uncle Vadim: This is vodka? Ask grandma: This is borscht? ДА as you probably guessed, is the Russian word for YES. Tell her: Yes, this is John. This is Dad. He is an engineer. Это папа. Он – инженер. This is mom. She is a doctor. Это мама. Она – доктор. This is Jeff. He is a musician. Это Джэф. Он – музыкант. This is Steve. He is a student. Это Стив. Он – студент. This is Tanya. She is a student. Это Таня. Она – студентка. As always, let’s try to figure out the meaning from context. Again, you put his shotglass down and wander off in search of yours. So, how would you translate these? As we see, Russian has two different ways to say “my.” And actually, it has many, MANY more ways to say “my.” But first things first. Let’s see if we can figure out when to use мой and when to use моя. And how about: She is my student. In your own words, how would you describe the pattern here? Hit pause and think about it for a moment. OK, so…If a word ends in an “ah” sound — like пиццА студентКА and водКА — it needs “моя.” Otherwise we use “мой”. This is where so many Russian courses go wrong. They burden students right off the bat with the intimidating grammar terms for this. They make students memorize stuff like “nominative case” and “adjective noun agreement” and “declension paradigms” as if that’s how we actually learn grammar. Well it’s not. I’ll say it again, because this is a fundamental point: Russian grammar is based on rhyming. These words that end in an “ah” sound: пицца…водка…студентка and so on, are called feminine. All the others are considered masculine. Now, admittedly, the masculine pairs weren’t really rhyming. I mean, суп doesn’t rhyme with мой. Neither does студент or доктор and so on. But masculine words WILL rhyme in many other situations. It depends on the phrase. Just know that there is a ton of rhyming in Russian, and I’ll be pointing it out as we go. There is one exception to this pattern, though. Listen to our native speaker say: This is my Dad. Это мой папа. Hmm….ПАПА ends in an “ah” sound, so why didn’t we say “моя”? Well, simply put, papa is masculine. Isn’t it? I mean, your Papa is a man. It doesn’t get more masculine than that. So, despite the “ah” sound at the end of papa, it’s still treated as a masculine word. That’s why it gets мой. So, твой and твоя are two forms of the word “your”. It’s an informal version that we use with friends and family members. We’ll learn the formal version in a future podcast. But we used the masculine form, твой with the word суп. We’ll phrase it literally just: He your student? Ask: Is this your dad? Yes, this is my mom. Yes, this is my dad. Did you remember to use the masculine forms — твой and мой — for the word папа? Good! Yes, this is your borscht. Yes, this is your pizza. Yes, he is my doctor. This is my dad. He is an engineer. Это мой папа. Он – инженер. I bet you did great with those, so treat yourself to a slice of pizza today. And as you eat it, tell yourself, Это моя пицца. In the next episode, along with teaching you some cool new phrases, I’m going to clear up a myth that people seem to believe in about Russian pronunciation. And in the meantime, as I mentioned at the end of the last episode, I’ve made a short, practice version of this podcast. It has just the exercises, without the explanations. So head over to RussianMadeEasy.com to grab a copy of those, and download the transcript to this podcast, and I’ll see you in the next episode. 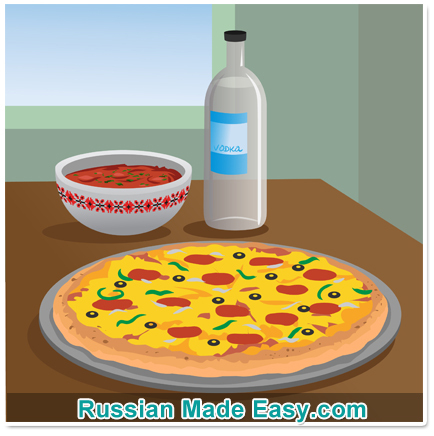 Learn Russian: Russian Made Easy 25 Привет! And welcome to episode 25 of Russian Made Easy. Как у тебя дела? Your website is great. I like all the verbal practice that you have us do. I’ve been learning Russian from 2 other websites (dotty-dingo and russianforfree). I’ve learned a lot from the other websites, but felt like I needed to try a different approach. My 8 year old daughter and I just started this website this week. She’s much more receptive to your method than trying to learn about the Russian Cases! You’re absolutely right about learning to speak right away first, and then learn the grammar AFTER. My goal is to eventually become fluent in Russian, to the point of possibly getting some kind of interpreter job or something. If it happens, great. If not, I’ll still be fluent in Russian, which is awesome on its own terms. Well, on to your lesson 3. Talk to you again soon. Thanks for your kind words about my podcast. So glad both you and your daughter are enjoying it. Anyway, keep up the great work…both of you! I absolutely love your podcasts and exercises! I find your content really educational and useful and I really appreciate it! Thank you so much! Thank you so much Mark! You are doing an excellent job! I’m a native greek speaker and I speak also English and Italian. I tried a few times to have a glimpse into Russian and it was so difficult following the classical textbooks ways.. Learn the alphabet, the handwritting, learn this, learn that and remember nothing.. Your method is great and reminds me how I started speaking Italian gradually when I lived there for a long period. This is how humans learn how to speak and this is how foreign languages should be tought..
Congratulations, I will be a very frequent visitor and fan of your website! Spasibo, Christos! I’ve been to Greece a few times (Crete, then Corfu) and have always been impressed by how — at least those in the tourism businesses — always seemed to speak both English *and* Russian. (Which was smart, given how many Russians travel to Greece.) Anyway, I’m sure you’ll do great in the language. 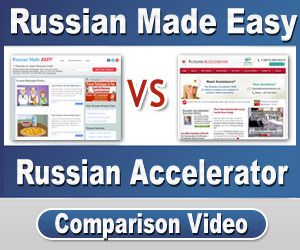 And I hope to see you in my Russian Accelerator video course! I hope you’ll stick through to the end as well. Please let me know how you do on the mid-term and finals of the podcast! Hi Mark! Thanks so much for an engaging way to learn a new language. Somewhere, you say Russian is one of the 3 hardest languages to learn and I was surprised to see that! This course makes it seem–well–easy! I have a trip to Russia in about a month and want to learn as much Russian as I can beforehand. I listened to half the podcasts a year ago and am re-starting them now. You mention Russian Accelerator a lot and I was wondering what your thoughts were on how to use your language material. Should I skip the podcasts and go straight to the Accelerator course or do the podcasts first (2 per day) and then Accelerator? 20 years ago I learnt Japanese one of the tough language in a Japanese University in a very complex way. They are of course well programmed for 6 full months. But your way of teaching is very practical. I just started yesterday and I find it very interesting & down to earth way of learning. Great lessons! One question. As a newbie how do I find out the SLT of a sentence? Are there particular books/ online resources that will help me look these up? Thanks for writing. Glad you’re enjoying my Russian Made Easy podcasts. I hope you’ll check it out. We’ll turn you into a confident, conversational Russian speaker! Thanks again for your kind words of support. Hi there, I have found your course about two weeks ago. I find it very useful. Most of my practice is during driving a car. I am listening to the material every day and I think I catch it:)My native language is polish, so I think it is a little bit easier to learn the pronunciation. Thak you very much, because I have just started my adventure with this language. All the best Mark. Greetings from Wroclaw – Tom. Thanks for writing, Tom. I love travelling to Poland because–though I don’t speak much Polish–I can understand a surprising amount of what I read. Anyway, hope to welcome you to my Russian Accelerator video course one day.